How do I know if I have an alignment problem in my spine? Only a Chiropractor can accurately determine if you have an alignment problem in your spine, however, if you have an alignment problem that is causing a pinched nerve, than you are likely wondering about this possibility already. The most common indicator of a pinched spinal nerve is pain that comes and goes with varying intensity and shows up when when you least expect it. As a matter of fact, a common pattern is after taking it easy or resting for a day or two, the pain will often be worse than on a day when you go through your regular routine of work, errands etc. Also, random pain is not the only indicator, just the most common. Numbness, weakness in certain muscle groups, sensations of hot or cold, fatigue, low energy, dizziness, and altered posture also mean you likely have an alignment problem going on in your spine. It’s important to realize that virtually all of the nerves that supply all structures in your torso and limbs run through your spine, so your symptoms may be felt quite some distance from where the nerve is being pinched in your spine. Keep in mind that most spinal alignment problems develop slowly over time with the pain or obvious symptoms showing up once the problem has progressed to the point of a nerve becoming pinched. This explains why in the majority of cases we see, the pain first showed up when doing something trivial like reaching down to pick something up off the floor or rolling over in bed at night. Less commonly the alignment problem can develop very quickly, usually following a fall, trauma, or trying to lift something that is way too heavy! How will Chiropractic fix my problem? Simply put, through adjustments to your spine. An adjustment is a light, hands on way of easing the vertebrae back into place to remove the pressure from the nerves that are pinched. Often it will take a few adjustments to restore the alignment to the spine correctly enabling the pressure to stay off the nerve that was pinched. Do I have to have my back cracked? NO. Modern Chiropractic care consists of many different treatment techniques and there are several that do not involve having any noise coming from your spine as your vertebrae are realigned. At The Back Doctors Wellness Clinic you are in charge of your treatments at all times, and we never perform any procedures you are not comfortable with. How we ensure this is by explaining everything in great detail, making sure you understand the exact nature of the alignment problem, and by making sure you understand all of the treatment choices available to you, including the pros and cons of each option. Then you decide which approach you are comfortable with (if any), and we proceed. If for any reason you change your mind after any particular procedure, we respect that as well. Remember, our hands will tell us where your alignment problems are, but they will not tell us what it feels like to be you, so we depend on you for your input! Do Adjustments hurt? What does it feel like? Chiropractic adjustments feel good for most people. There is often a sense of pressure being released right after the adjustment, though it may take a while for all of the symptoms to ease. Even in the cases we see where someone’s spine has been subjected to extreme neglect or injury, Chiropractic adjustments are normally less intense than the symptoms that the person has been suffering with, and they often provide immediate improvement. At The Back Doctors Wellness Clinic we always select the technique that will suit your individual needs and your individual body type best. Your input is a big part of this process! We help many different people who vary in age, occupation, lifestyle, and overall health. With that in mind, this becomes a difficult question to answer accurately. Generally, significant improvement often begins after just a couple of visits, and more lasting relief of symptoms is usually established after a couple of weeks of Chiropractic adjustments. Of course we can give you a much better idea of what to expect after we meet you, examine you, and show you what`s going on with your spine! YES. This question used to be asked commonly, but has been answered by the millions of Canadians that have enjoyed relief from back pain, neck pain & headaches. Numerous government and university studies have now demonstrated that Chiropractic is the most effective treatment for low back pain. In fact, Chiropractic has grown to become the third largest primary contact health care profession in Canada behind medicine and dentistry, through its dramatic success with back pain treatments. Chiropractic care routinely helps people to feel so much better ie: pain free, more flexible, healthier, higher energy levels, better sleep and so on that many people choose to use Chiropractic care in a preventative way, much like regular oral hygiene at the dentist. For others, once the pain is resolved we send them on their way! Once starting Chiropractic will I always have to go? NO. Although some people find the numerous health benefits of regular Chiropractic adjustments too great to ignore, others prefer to discontinue care once their pain has been resolved. These people often return to The Back Doctors Wellness Clinic a few years down the road if they injure themselves, as they have found our treatments to be so effective. This does not mean they are addicted! It does mean that they know Chiropractic care has been helpful in the past and it will likely be helpful again, if the need arises. It`s true there are a plethora of treatments and explanations out there these days making claims and promises about back pain, often leading to confusion in you, the consumer. The important thing to understand is that very few professions are actually licensed to DIAGNOSE the source of back pain. This short list includes medical doctors, medical specialists, naturopaths, and Chiropractors. 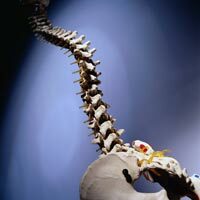 Of these, only Chiropractors and some surgeons devote their entire practice to spinal health restoration. Surgery is for end stage spinal problems and Chiropractic care is the treatment of choice for earlier stage causes of back pain. Chiropractic adjustments for back pain are so effective because they are directed at the cause of your pain, not just the symptoms. How well educated is a Chiropractor? It takes a minimum of 8 years of University/College to become a Chiropractor. The training is very similar to that of a medical doctor, with more class hours spent on anatomy, neuroanatomy, spinal anatomy, radiology, spinal palpation and adjustment, than a medical doctor and less class hours on pharmacology than a medical doctor. This in depth training is essential to enable Chiropractors to be licensed as primary health care providers and also provides them with the excellent clinical skills required to diagnose spinal conditions and determine when an outside referral is necessary. My doctor told me I have Arthritis. Can Chiropractic help? Absolutely, here’s how: Osteoarthritis, by far the most common form of arthritis is simply put, a description of what is going on in a joint as it is wearing out. This form of arthritis is normally very slow, taking years to develop. A scenario we see in our office quite commonly is a middle aged patient has developed back back pain over a brief period and has subsequently gone to see their MD about it. The medical doctor then orders X-rays which reveal mild to moderate arthritis in some parts of their spine. Next, the patient is told that they have arthritis and they`re just going to have to live with it. The problem with this logic is that it takes years for arthritis to develop, yet the pain has shown up quite suddenly. Eventually, a friend convinces them to get a second opinion and brings them in to our office to see us, where we review their history, X-rays, perform an examination and figure out what`s really going on. In most of these cases we find that there is an underlying spinal alignment problem along with a pinched nerve which is complicated by the arthritis at that level in their spine. Cases like this routinely respond very favorably to our treatments, even though the arthritis changes the joint structure a little making it easier for the nerve to become pinched. Correcting the underlying alignment problem removes the pressure from the nerve eliminating the cause of the pain. We then show these patients how to take care of their spine in a variety of ways to in order to reduce or eliminate the progression of the arthritis, so they can get back to enjoying life. How do I know if Chiropractic will help me? The most direct way is to book an appointment with Dr. Newberry or Dr. Simpson, come and meet your doctor and discuss your particular health issues. At this point you will find out if Chiropractic care is the right choice for you. If it is not, we will let you know what you should consider doing instead, and why. At a minimum, you will leave feeling that you now have a pretty good idea what is wrong and who you need to see to resolve your health issue. If you are not comfortable with the above suggestion there are other options. You can call Debra, our office manager and book a phone consultation with your Chiropractor, or pose your question to her, whatever you are more comfortable with! We also welcome you to read the section of this site called “what our patients say” to get an idea of the vast diversity of the kinds of health issues we are routinely successful with. Alternatively, you are welcome to drop by our office anytime during regular office hours to meet our doctors, staff, therapists, and patients!